Tinneas Sidhe: Afflictions from the Fairy Realm. One of the central doctrines of the Gaelic ‘fairy faith’ (Irish: creideamh sidhe/sí, Manx: credjue shee) was the belief that the ‘Good People’ could cause illness and disease. Although such a belief is well documented, the mechanics of it have rarely been explored in any great detail, although followers of my blog may have been able to gain a passing insight. 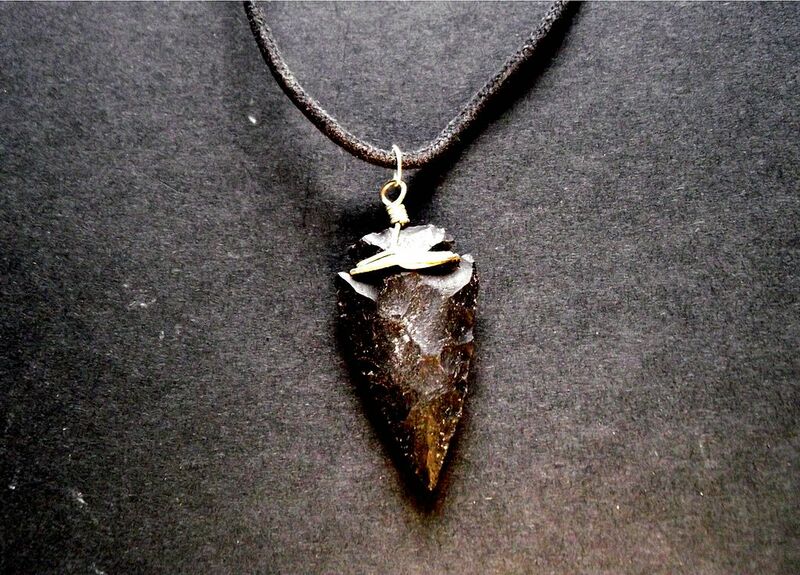 An ‘Elfshot’ or Neolthic flint arrowhead, here mounted as a lucky amulet. They think, the women have peculiar charms for all evils, shar’d and distributed among them; and therefore they apply to them according to their several Ailings. They begin and conclude their Inchantments with a Pater-noster and Ave-Maria. When any one gets a fall, he springs up, and turning about three times to the right, digs a hole in the ground with his knife or sword, and cuts out a turf; for they imagin there is a spirit in the earth. In case he grow sick in two or three days after, they send one of their Women skill’d in that way, to the place, where she says, I call thee P. from the east, west, south and north, from the groves, the woods, the rivers, the fens, from the fairies, red, black, white, &c. And after some short ejaculations, she returns home to the sick person, to see whether it be the disease Esane (which they imagin is inflicted by the Fairies,) and whispers in his ear another short prayer, and a Paternoster; after which, she puts coals into a pot of clear water, and then passes a better judgment upon the distemper, than all the Physicians. Although this account is particular to one individual from the South of Ireland, the concepts of the the ‘Fairy Stroke’, ‘Fairy Blast’ and ‘Evil Eye’ were more universal within the Gaelic world, and indeed further afield. The Fairy Blast: The English word ‘blast’, meaning a ‘gust of wind’, was equivalent to the the Gaelic gaoithe, and the ‘fairy blast’ was referred to as ‘sidhe gaoithe‘ or perhaps ‘gaoithe sidhe‘ in Ireland, a term which was once often applied specifically to tornados and dust-devils, which were once believed potent visible manifestations of this force. The connection between spirits and winds is an ancient one: for starters, the Latin word for ‘soul’, anima, also carried the meaning of ‘breath’ as well as ‘spirit’ and ‘life’. Common technical understanding of spirits was that they were invisible and made of a very rarified substance akin to light itself. Because of this subtle nature, they were only usually able to move very light things, such as the air, and it was common for the medieval mind to attribute sudden unexpected gusts of wind to the provenance of demons or spirits. In fact, modern ghost beliefs still continue this tradition. Why were gusts of wind associated with disease? Ireland and Britain are lashed by seasonal winds and storms that are usually fairly predictable on the calendar. These events (more typically at the onset of winter) coincide with a change in the patterns of disease, such as an increase in infectious diseases of the respiratory tract. Wind can itself be a terrible and violent force, and is to be feared for this alone. The ancient ‘elemental’ and corresponding ‘humoral’ doctrines of disease saw health and vitality as being in a state of ‘heat’ and ‘moisture’, whereas the wind was ‘cold’ and ‘dry’, and could therefore be considered contrary to health. The mythological Cailleach Bheur of Scotland personified these energies, as did the Sluagh Sidhe – a turbulent aerial host of roaming spirits who were sometimes held responsible for the effects of the Fairy Blast. In the Anglo-Manx dialect of the 19thC the word ‘blass’ (blast) was used to denote a skin lesion – a spot, boil, lump or rash. The English word ‘blister’ derives from ‘blast’ (a German word), indicating that gusts of wind must have been associated with wind from Anglo-Saxon times or earlier. The suggestion is that external diseases were considered a form of buffeting or abrasion from a force without. 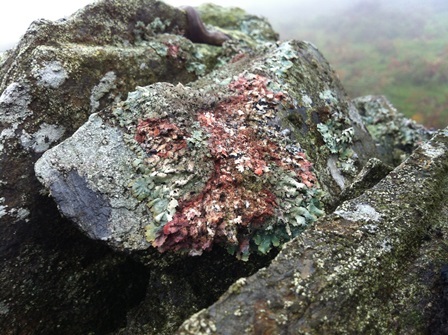 Interestingly, in Manx skin rashes were also called ‘Chenney Jee‘ (Irish: Tinneas Dia, ‘God’s Fire’ – Ignis Sacer) as it was commonly believed in ancient and medieval times that the gods or god would burn the wicked with ethereal fire, which of course is also the substance from which spirits and divinities were conceived as being composed of. Of course the Irish/Gaelic word for disease – tinneas – is derived directly form that which means ‘fire’ (teine), illustrating that an ancient concept linked disease to the unseen spiritual fire. A good crop of Ireland’s prime ‘fairy herb’ – Digitalis Purpurea. 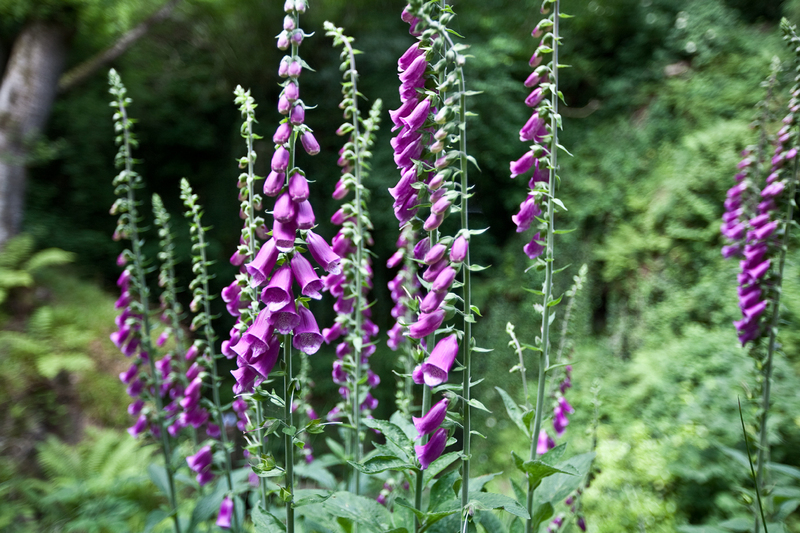 Also known as ‘Luss Mor’ or ‘Foxglove’, it was used in ‘cures’ to defeat fairy influence. Notoriously it was occasionally fed to ‘changeling’ children, causing their death. THE islanders, like all the Irish, believe that the fairies are the fallen angels who were cast down by the Lord God out of heaven for their sinful pride. And some fell into the sea, and some on the dry land, and some fell deep down into hell, and the devil gives to these knowledge and power, and sends them on earth where they work much evil. But the fairies of the earth and the sea are mostly gentle and beautiful creatures, who will do no harm if they are let alone, and allowed to dance on the fairy raths in the moonlight to their own sweet music, undisturbed by the presence of mortals. As a rule, the people look on fire as the great preservative against witchcraft, for the devil has no power except in the dark. So they put a live coal under the churn, and they wave a lighted wisp of straw above the cow’s head if the beast seems sickly. But as to the pigs, they take no trouble, for they say the devil has no longer any power over them now. When they light a candle they cross themselves, because the evil spirits are then clearing out of the house in fear of the light. Fire and Holy Water they hold to be sacred, and are powerful; and the best safeguard against all things evil, and the surest test in case of suspected witchcraft. That this concept was once common across Europe (from Russia to Iceland), indicates that it was an official church doctrine to equate fairies and elves with the fallen angels of the biblical narrative’s interpretation. The legend of the Fall popularly ascribed elemental stations to the angels when they lodged in the various parts of the ‘Elemental’ mundane world. The spirits who occupied the air evidently became the ‘Sidhe Gaoithe’. The gradual onset of skin lesions can fit logically with the mode of action of wind which frequently starts gently and increases gradually. Sometimes, mysterious bruises appearing upon the limbs were ascribed to ‘fairy pinches‘, and in the Isle of Man it was once a customary belief that improper piety to the Good People by not leaving them a bowl of fresh water at night would invite these particular skin blemishes. However, the sudden onset of illness was attributed to what is known as the ‘Fairy Stroke’. A striking or blow by the fairies (or unspecified spirits) was deemed responsible for a number of afflictions which might sometimes also be classed as ‘Tinneas Sidhe’: A sudden sharp pain, seizure or paralysis was likely caused by a ‘stroke’ or blow from an invisible being. The term even persists in the English language for describing the effects of a cerebral infarction or haemorrhage! The idea of being ‘Buailte‘ (‘struck’), is actually quite a complicated subject which combines with that of the Evil Eye, the Fairy Blast, and the concept of being ‘Elf-Shot’. Obviously, the attrition of jealous fairy-folk was often blamed for the wasting and fading of vitality associated with particular diseases, a fact often noted by observers such as William Robert Wilde during Ireland’s famine era. In Ireland, the term ‘Cnaoidh’ (‘Cnai’) was used to describe the effects of marasmus (whole body wasting due to dietary energy-deficiency) common to that period. Other widespread endemic diseases such as Tuberculosis and Rickets could also cause such states, as would conditions such as cancer. The power of the Otherworld (expressed so potently by Kirk) to take away life and vitality from those considered vulnerable: ‘Changelings‘ were not just infants, but could also be older children, even adults. The folklore of the ‘changeling’ was a very ancient and common feature of fairy-beliefs up until the 19thC. It was noted that apparently healthy and flourishing children might all of a sudden become sickly and gradually dwindle away. Such beliefs were common before modern medical sciences began to understand and deal with many of the causes of infant and child mortality, particularly malnutrition (which often also affected the minds and judgement of parents) as well as infectious diseases, diabetes and cancers. Formerly, it was believed that the suddenly ‘different’ child was replaced by a fairy child, while the latterly vigorous youngster was taken to continue thriving in the fairy realm. Summary: The fairies of Atlantic Europe were believed capable of causing disease, either by the mode of removing nutritional vitality and quintessence through their hunger for the goodness of the living, or through physical attacks by searing magical fiery (or chilling) winds, or by dispensing ‘projectiles’ causing sudden ‘attacks’ of disease. They also possessed the power to abduct and control people – making them ‘wild’ or mad.